Join Mark Dushkes for a slide show presentation and special hands-on demonstration of the restoration, repair and preservation of Japanese folding screens. Audience members are welcome to bring screens and/or scrolls for a non-appraisal evaluation by our speaker. Mark Aaron Dushkes, owner of Aaron Studios, studied Japanese history and language in college including a year studying in Tokyo. After many years working with Asian antiques he was fortunate in being offered a traditional apprenticeship in 1986. He trained for 2 years in Ohara, a small town outside of Kyoto Japan, in the studio of a master restorer. After his apprenticeship he returned to California in 1988 to found Aaron Studios. For the past 10 years he has been working in the traditional way repairing and restoring screens (byobu) single panels (gaku) and standing panels (tsuitate). Find more about the history of Japanese Screens at: www.screenrepair.com. 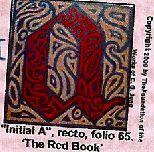 In this richly illustrated 90-minute lecture, manuscript illuminator Mel Ahlborn reviews 'The Red Book' by Carl G. Jung (W. W. Norton, 2009) Ahlborn's talk will highlight the book's history, drawing upon material from Jungian scholar Sonu Shamdasani. She discusses the book designs and page layouts seen in Jung's original manuscript and in the Norton 2009 print edition, and concludes with an analysis of Jung's calligraphic hands, drawing techniques, and major illuminations. An aerospace engineer who became an artist, Mel Ahlborn specializes in historic production techniques for manuscript illumination, from which she draws inspiration for her modern and multimedia fine art. Ahlborn is principle of Illumination Studio, an artists' studio in San Francisco's East Bay serving museums, film companies, academic institutions and private clients since 1989. Her work is shown throughout the United States, including The Getty Center Los Angeles, the Palace of the Legion of Honor San Francisco, and the National Cathedral in Washington, D.C. Reach Ahlborn at mahlborn@illuminationstudio.org and follow her on Twitter @illumination1.